NETWORK FINALS: FOX’s NFL PLAYOFFS game adjusted to 10.3. 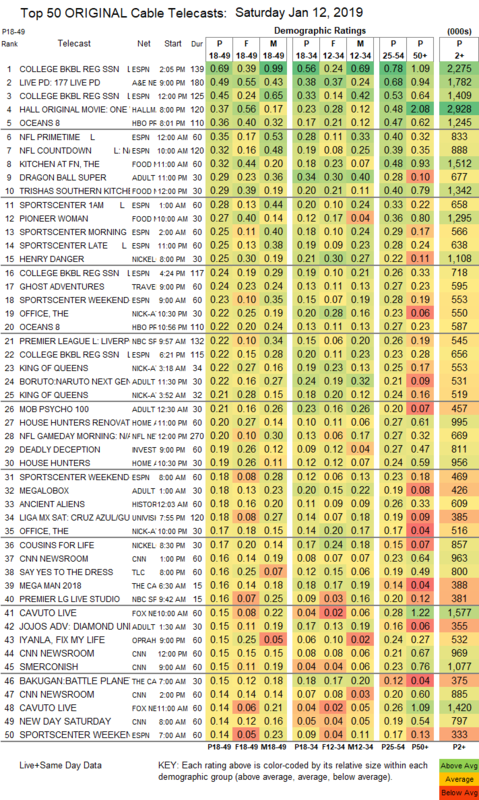 Elsewhere, the rerun of THE TITAN GAMES dropped 0.2 in final numbers, and the rerun NCIS: LA lost 0.1. CABLE HIGHLIGHTS: ESPN’s COLLEGE BASKETBALL coverage was at 0.69/0.45. 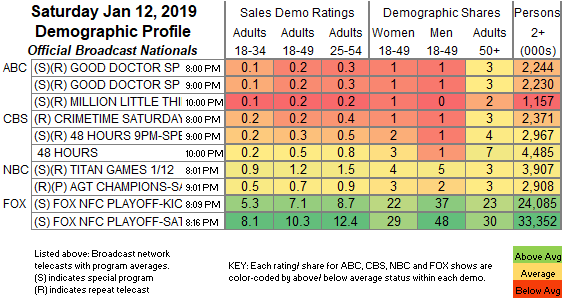 A&E’s LIVE PD dropped 0.12 to 0.49. Hallmark’s movie ONE WINTER PROPOSAL was at 0.37. (Note that HBO lists its theatrical movies as “originals,” which is how they end up on our charts.) On Food Network, KITCHEN AT FN ticked down to 0.32, TRISHA’S SOUTHERN KITCHEN gained 0.02 to 0.29, and PIONEER WOMAN was up 0.03 to 0.27. The Adult Swim line-up performed as follows: DRAGON BALL at 0.10/320K, 0.10/321K and 0.29 compared to 0.14/363K & 0.14/367K & 0.34, BORUTO up 0.01 to 0.22, MY HERO ACADEMIA up 0.01 to 0.21/491K, MOB PSYCHO 100 up 0.02 to 0.21/457K, MEGALOBOX down 0.01 to 0.18/426K, JOJO’S BIZARRE ADVENTURE down 0.03 to 0.15, BLACK CLOVER down 0.06 to 0.14/325K, HUNTER X HUNTER down 0.05 to 0.13/296K, NARUTO down 0.06 to 0.13/293K, ATTACK ON TITAN down 0.05 to 0.11/234K, POP TEAM EPIC down 0.03 to 0.10/208K, and MOBILE SUIT GUNDAM down 0.04 to 0.09/189K. Nickelodeon’s HENRY DANGER rose 0.06 to 0.25. ID’s DEADLY DECEPTION was steady at 0.19. TLC’s SAY YES TO THE DRESS ticked down to 0.16, and FOUR WEDDINGS was at 0.13. On OWN, IYANLA FIX MY LIFE returned at 0.15.